I need to find a homemade or commercial solution to the best possible deodorant solution. It needs to be an anti-perspirant, odor neutralizing, with low or no harmful chemicals, that also does not stain clothes. Multiple applications could be considered. I have yet to find one deodorant that fits all these descriptions. Much appreciated! People who try to cover BO with cologne or other fragrance don't realize how disgusting that smells. Natural human odor may not be pleasant but natural human odor plus fragrance s disgusting! essential oils. normal cologne is pretty nauseating, but men who use just a drop or two of essential oils smell amazing, you can find man different scents at most health food stores. Some years ago I was getting crazy rashes from antiperspirant. How long does that antibacterial effect last? I don't really stink. I actually shower much less now. yes, i use this too and its AWESOME. yes, regular rubbing alcohol works well for me as well. My experience is that if you really stink, there is something wrong with your diet, your are never taking a shower/bath, or you don't know how to wipe your a$$. Otherwise, you will smell fine. same here. I've been using coconut oil and baking soda for a while now. no odor problems, even on long, stressful days. I think using anti-perspirant is not very good for your body. What should matter is that you don't smell, not that you don't sweat. I use 95% Alcohol (70% will do as well). It kills the germs that create the bad smell. Works perfectly for me. Best to buy a plastic sprayer and use it to apply the alcohol. May need to reapply at the evening. It might not be enough for your shirt not to smell, though, since it will have germs on it that will react when exposed to your sweat. If using a shirt that you've already worn since the last washing, spray some alcohol on it in the underarm area. I use regular Arm & Hammer baking soda after my shower. I apply the powder to a moistened underarm and it sticks and works well for me. Some people have complained that it is like little rocks underarm...too rough...others mix coconut oil with the baking powder and keep in the fridge as a block stick. I buy the Arm & Hammer in a 13 pound bag at Sams for around $6. Lasts at least two years. I haven't tried it myself, but she's done a lot of experimenting and feels like she's come up with the solution. She also has comments on things she tried that didn't work, so it should be informative. Good luck! 1) sufficient dietary zinc (not excessive but sufficient) from food and/or supplements if needed. 2)70-80% EtOH swiped under arms works for some people. It's called a "mineral salt deodorant stone". All you do is wet it then rub your underarms like any deodorant. There's no smell and no chemicals, just 100% natural deodorant. Works great! Here's what I use: H2O. I think using anti-perspirant is not very good for your body. What should matter is that you don't smell, not that you don't sweat. I use 95% Alcohol (70% will do as well). It kills the germs that create the bad smell. Works perfectly for me. Best to buy a plastic sprayer and use it to apply the alcohol. May need to reapply at the evening. It might not be enough for your shirt not to smell, though, since it will have germs on it that will react when exposed to your sweat. If using a shirt that you've already worn since the last washing, spray some alcohol on it in the underarm area too. Problem solved. Just wanted to add, containers of up to 100ml liquid are cabin flight friendly (at least in Europe), which is important since I normally avoid travelling with luggage. That size is probably more than enough for a few weeks. 100ml is a normal size for pharmacy alcohol bottle, but it's better to buy larger containers at the supermarket (if it's labeled as cleaning material, make sure it does not contain perfume!). Any cologne ideas to make you smell like a super stud? You can review some products in Deodorant Center , I think you should use crystal deodorant,100% natural mineral salts named Ammonium alum and can last for a year in a storage. weleda brand makes good deodorants, they are essential oils and alcohol, they do nothing for perspiration though..........sweating is good for ya! I use hydrogen peroxide followed by baking spade. I suffer from horrible armpit odour and this method has been the best natural remedy I've found. Works every time. The hydrogen peroxide kills the bacteria and clears any odour, while baking soda works to alkaline the ph balance. Baking soda is also an anti bacterial so it works great for all day support. Occasionally I will use lemon, which is an anti bacterial, moisturizure, and will also help alkaline. Although, my odour is so bad this doesn't always work for me. My mom, however, has used lemons for years now (she also eats almost entirely raw which is why she doesn't really smell anyway). I will also exfoliate my under arms in the shower. Sometimes I use a rough loofah or sometimes I use baking soda. I find that this will help as long as I follow up with the hydrogen peroxide. Look into maybe doing a juice fast, or drinking about 1 teaspoon in a few table spoons of water (you can shoot it if you can handle the salt water flavor, I personally do not mind it at all). The more alkaline your body is, the less bacteria can sustain itself, therefore the less you will smell. been using cyrystal salt deodarants for years. It smells good, works better than any store-bought brand and lasts a really long time. It's also easy to share with friends so now most of my friends use it too. 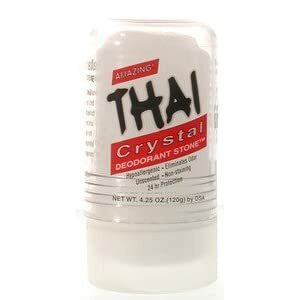 I began using the crystal deodorant a few years ago and it works fine. But I noticed it was packaged in a # 7 plastic case (that's BPA I believe) so I was motivated to read about the ideas in this post. The first thing I tried worked so well I never got to the rest. Coconut oil rubbed on clean pits still a bit wet from the shower. No white stuff. No smell whatsoever. Soft skin. Amazingly no oil stains. Excellent! I've rotated thru so many options like making my own out of coconut oil, essential oils, baking soda, using magnesium chloride which burned to all hells, but worked amazingly. The only one I stand by now is Milk of Magnesia. $4 a bottle and you can just buy some cheap roll on deodorants from the 99cents store and refill with that. You'll smell if you're sweating more than usual with it on, however the smell will dissipate in a bit. I use a mix of 1/2 baking soda, 1/2 cornflour (1/4 cup each, with a couple of drops of patchouli oil for fragrance) which has proven quite effective. I use a crystal salt deodorant or sometimes baking soda. I don't find myself being any smellier than I was when I used Secret. On hot days, I wash my armpits with my homemade yogurt to help kill the bacteria and then put the salt stick or baking soda on it. I find that I don't sweat nearly as much as I did before, so I don't use an antiperspirant. I hate commercial antiperspirants. I find that people who wear them often smell worse - bad B.O. plus cheap perfume - than if they just let the air dry out their armpits and kill the bacteria. I just bought myself some Lavender scented Tom's of Maine. propylene glycol, water, sodium stearate, organic Aloe barbadensis leaf juice, zinc ricinoleate, glyceryl laurate, natural fragrance, Humulus lupus (hops) [CO2] extract, organic Helianthus Annuus (sunflower) seed oil, ascorbic acid, organic *Cymbopogan flexuosus oil. Propylene Glycol. Geez, is it really that serious?? natural-health-information-center.com says, "A cosmetic form of mineral oil found in automatic brake and hydraulic fluid and industrial antifreeze. In the skin and hair, propylene glycol works as a humescent, which causes retention of moisture content of skin or cosmetic products by preventing the escape of moisture or water. The Material Safety Data Sheet warns users to avoid skin contact with propylene glycol as this strong skin irritant can cause liver abnormalities and kidney damage." And it's the first ingredient. Crap, maybe I should reconsider. Of course, Wikipedia says that Propylene Glycol is a safe additive for DOG FOOD! Poor Dogs! I think I can safely say that it won't harm me. Sodium Stearate is generally regarded as safe. Zinc Ricinoleate - A derivative of Castor Oil. "Another interesting ingredient is Zinc ricinoleate. This is the zinc salt of ricinoleic acid, extracted from the seeds of the castor oil plant. Zinc ricinoleate does not inhibit normal perspiration, and will not interfere with the natural flora of the skin. Instead, it ‘fixes’ the odours produced by bacterial decomposition in sweat so that they cannot be released into the atmosphere and cause the characteristic sweaty smell." Safe in humans and animals. Glyceryl Laurate - "In the human system, lauric acid is converted into monolaurin. Monolaurin is found in coconut oil and human breast milk.1 It may be useful in the prevention and treatment of bacterial infection or generally as a microbicide." from Wikipedia. I like it. Seems safe, and it smells like lavender and has a faint Patchoul-ish, marijuana odor to it because of the hops, which I happen to like. It's $6. Not too bad. I use apple cider vinegar applied to both pits with a cotton ball. The theory behind it is that it raises the pH of your skin under your arms and the bacteria that creates the smell can't live there anymore. I've done this for over a year and a half with great results. The ACV smell goes away after just a few minutes. Arm & Hammer makes a decent stick deodorant themselves. On hot days, re-application may be necessary. I like this one. Don't know about toxins, though. Ingredients: Active: Aluminum Zirconium, Tetrachlorohydrex (anti-perspirant) Inactive: Cyclopentasiloxane, PPG-14 Butyl Ether, Stearyl alcohol, ethylhexyl isononanoate, hydrogenated castor oil, talc, petrolatum, ethylene brassylare, sodium bicarbonate, peg-25 propylene glycol stearate, silica, corn starch modified, polysaccharides, maltodextrin. Should have gone there before I typed in the back of my stick. Mine is unscented, and it masks pretty darn well. It seems less evil than other options, I guess. Anyhow, I'll keep using it for convenience. Since I'm not working it's occasional for me. I hope this was helpful!